Advice to buy a Dobsonian. Like the 80's song say "I Just Can't Get Enough". I'm already planning my next Mod. It will be a Dew Shield. d = size of object in arc seconds. I just got "The Urban Astronomer's Guide" by Rod Mollise, and I reached this part where he states that this equation is useful to calculate the "true" brightness of an object according to his size. He gives an example with M101, 7,9mag. and 22 arc min., and he gets a "true" magnitude result of 14,2. He gives another example with M97, 9,9mag. and 3,4 arc min., and the result is 13,63. What I don't understand is how he gets those totals? I've tried... What does "log" and (70) stand for. Can somebody explain how he gets those results? In the book, there's not more information, and my knowledge of mathematics is very limited. So, what you say is that, with the information provided, it's not possible to use that formula at all? My Idea is this, if someone could, based on the author's text, replace that formula with the numbers provided. Then I'll understand it and perhaps then I can use it for further calculations. This is the scanned original text. Edited by alexantos, 11 April 2019 - 07:43 PM. 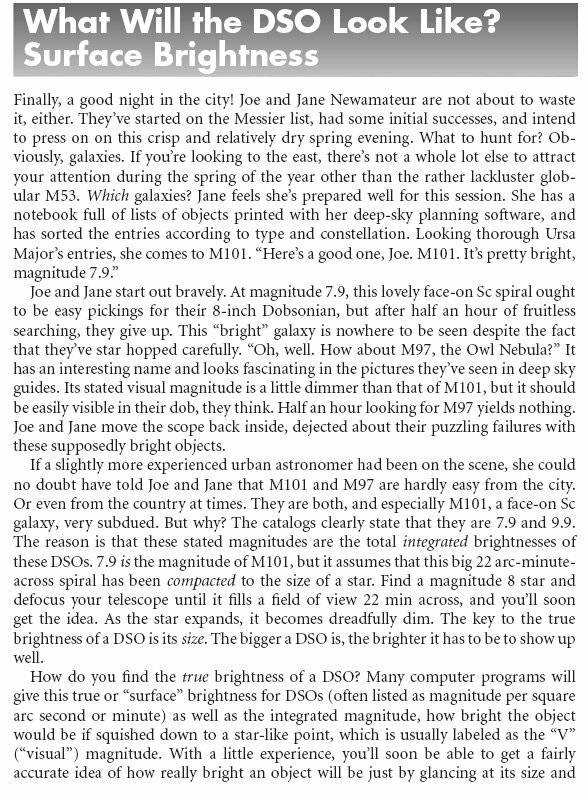 I think the main point of the article is that sometimes objects are listed with very bright visual magnitudes, but if they cover a large area of the sky, then they can be very difficult to see because they have such low "surface brightness" and thus a very low contrast with the background sky, especially if there is any light pollution. Stellarium, and some experience at the eyepiece trying to find some of the things that you find in there, is a great way to learn about the real meaning of surface brightness. With the information provided "log" means "log to base 10". Just google log(70) or log(22) then do the arithmetic. 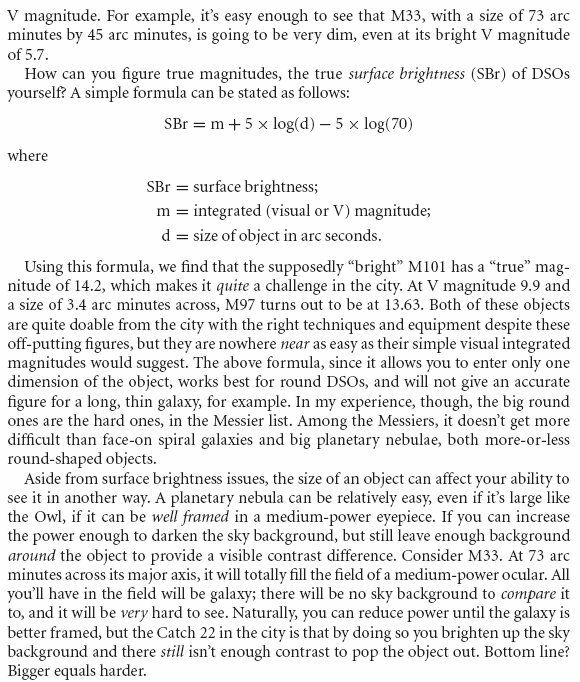 But Neil is right, there is no much point to calculating it, surface brightness is readily available for DSOs and it still doesn't tell the whole story anyway (some objects are easier to see than others of the same average surface brightness, because it is not uniform through entire object). Maybe you didn't understand what I'm "trying to achieve" with this formula. What I'm looking for is not the Surface Brightness value of an object. For that I use Stellarium as you can see in this topic I've started. Also you can get two parameters of SB if you want, namely mag/arc sec² and mag/arc min² as you can see bellow highlighted in green. What I'm looking to get is, as the Author mentions, the "true" magnitude of the object. 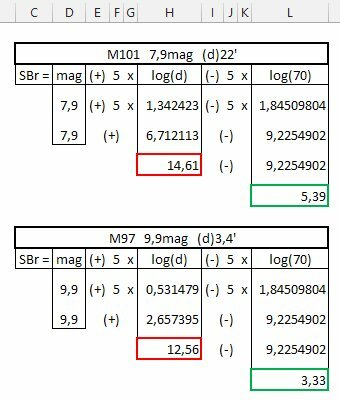 As you see highlighted in red, the magnitude of M101 is 7,86, but according to the Author's formula, the "true" one is 14,2. You didn't understand the purpose of it, but the explanation of it. The purpose of the Author's formula is to get the "true" magnitude of an object, according to his size and magnitude. Thus, with the formula, he gets 14,2 instead of 7,86. He mentions surface brightness mainly to explain the relation between size and magnitude. Edited by alexantos, 12 April 2019 - 08:24 PM. With the google info of log(70) and log(22), and applying those numbers, I got to different results from those of the Author. He says that, for M101 (mag. 7,9 and 22arc min), he gets a result of 14,2. For M97 (mag 9,9 and 3,4arc min) he gets 13,63. Is my arithmetic correct, or am I doing anything wrong (or missing something). Edited by alexantos, 12 April 2019 - 08:18 PM. He uses size in arc seconds in the formula, 22 is the size in arc minutes. You need to use 22*60. I think that you are mis-understanding the article. There formula in the article is not computing a "true magnitude". 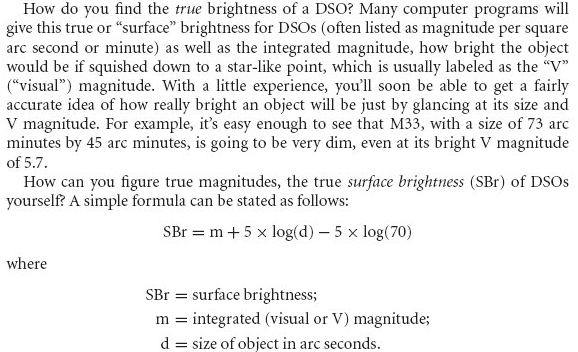 The article says that the formula is "SBr = m + 5log(d) - 5log(70)" and "SBr = surface brightness". So the formula in the article is for SURFACE BRIGHTNESS. That is the same number that is being reported to you by Stellarium, although Stellarium uses a different method to compute that number. The author writes inaccurately that the object has a " 'true' magnitude of 14.2" where the quotation marks indicate that the statement is not literally true. The Wikipedia page https://en.wikipedia...face_brightness gives the formula S = m + 2.5 log A where A is the AREA of the object in square arc-seconds. If we assume that the object is a square with a side of length d arcminutes, then the area in square arcseconds is A = (60 d) * (60 d) = 3600 d * d. Substituting that into the Wikipedia formula gives us S = m + 2.5 log (3600 d * d) = m + 2.5 log (d * d) + 2.5 log(60 * 60) = m + 5 log (d) + 5 log (60) which bears a close relationship to the formula in the article that is presented without any derivation (although I can't figure out why it is 70 instead of 60). I use the surface brightness information in Stellarium (in units of magnitudes per square arc-minutes or magnitudes per square arc-seconds) to "easily check how hard it will be to observe an object." You can develop a feeling for what levels of surface brightness are visible in your conditions, so that number in Stellarium can be your guide to what will be easily visible. I burn with envy. Cool mount! I bought SW OTA with rings and made the mount by my hand. Not so smooth but I ordered PTFE plate for bearing. You can balace it every time you need by adjusting position in rings. They allow it because I left some space at the bottom for that purpose. Edited by Swirl19, 16 April 2019 - 01:56 AM. Substituting that into the Wikipedia formula gives us S = m + 2.5 log (3600 d * d) = m + 2.5 log (d * d) + 2.5 log(60 * 60) = m + 5 log (d) + 5 log (60) which bears a close relationship to the formula in the article that is presented without any derivation (although I can't figure out why it is 70 instead of 60). I haven't worked through the math but I suspect if you assume the object is round or an ellipse rather than rectangular, you would find it close to 70. These are all approximations and provide an average surface brightness. In reality surface brightness varies over the objects surface. Galaxies generally have bright cores. That's why one can see the central core of Andromeda Galaxy from a light polluted urban backyard with modest binoculars. I've made a sort of a "study" using the Messier Galaxies, and both values, from Author's formula and from Stellarium. Neil, can you explain the discrepancy between these values? And why, using the formula, the brightness is inversely proportionate to the SBr values? Using the formula, the low values that suppose to be of the less bright galaxies are of the brightest ones. 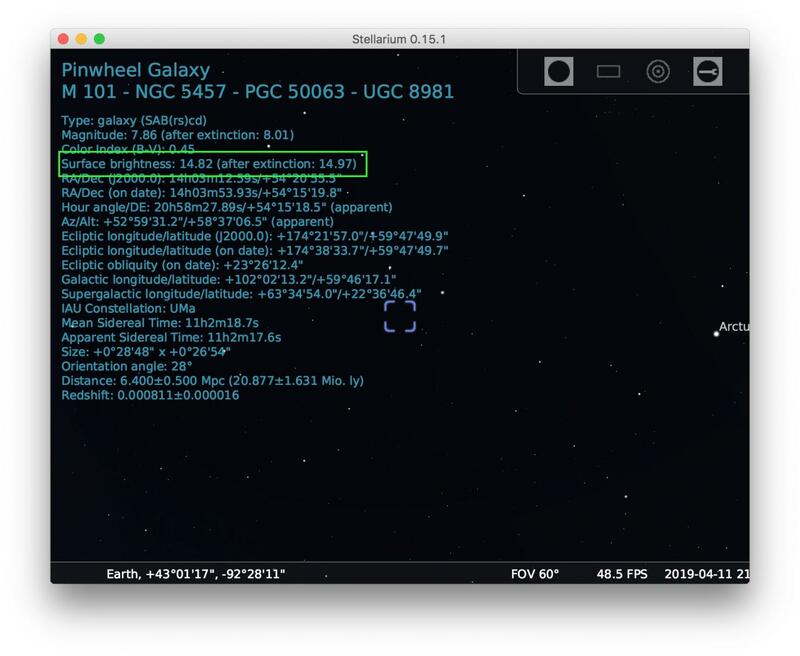 Using Stellarium, I can see no relation between the SBr values and the "real" brightness of the object. With my limited experience, I can tell that M31 was the first core I've seen, even with binoculars. It is by far the brighter one. M105 was also easy to spot, and somehow "easy" to see, compared to other cores. I tend to agree with Stellarium on the Sombrero(M104), but it is not one of the brightest cores I've seen, although it's pretty bright. 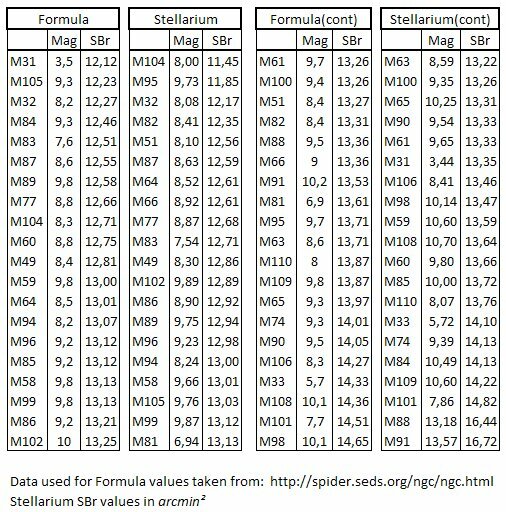 Regarding the second brightest object in Stellarium, M95, I've tried but couldn't see any trace of it. My interpretation of this values is that the author was not looking for the surface brightness of an object, like apparently Stellarium does, but for what he calls "the true brightness". I know that this is very subjective, and it is not accurate, mainly because objects have different shapes. But I find it very helpful for me (now that I understand the math thanks to "pregulla"), to have an idea of how difficult to see an object will be. Again, I stick to my idea that what the Author tries to get with the formula is "the true magnitude, the true surface brightness". So, I think that instead of SBr=, it should be Tmag= or TSBr=. It will make much more sense then.